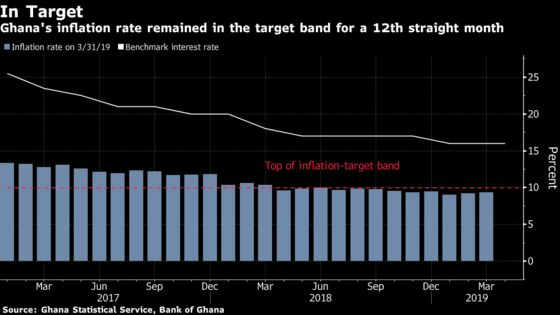 (Bloomberg) -- Ghana’s inflation rate remained inside the central bank’s target band in March, even as it increased for a second straight month. Consumer prices rose 9.3 percent from a year earlier, compared with 9.2 percent in February, David Kombat, deputy government statistician at the Ghana Statistical Service, told reporters Wednesday in the capital, Accra. Prices rose 1.2 percent in the month. The uptick in inflation is unlikely to be enough to make the central bank change course and start increasing rates again. After cutting in January, the Bank of Ghana warned at its March interest-rate announcement that it could tighten policy if inflation risks from a weaker currency materialize. The regulator targets price growth in a band of 6 percent to 10 percent. The small increase in the inflation rate comes after the cedi strengthened for the first month in four in March, following a drop of as much as 16 percent against the dollar this year. The statistics office still uses the old base year of 2012 and once it starts using the 2017 base for the index, that could change the inflation number.